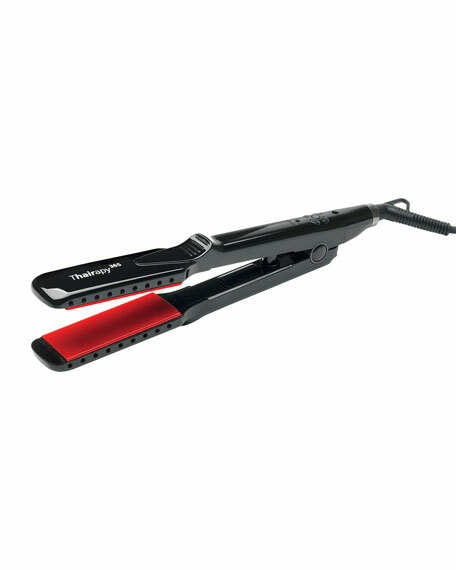 The Thairapy 365 Wet/Dry Styling Iron can be used on damp or dry hair. It drastically reduces the amount of heat needed to style hair. Wider plates allow more hair coverage with each pass, allowing for more efficient style time even for thicker, courser hair. The Wet/Dry Styling Iron leaves hair softer, silkier, and smoother hair than ever before by locking in moisture as it straightens. Ceramic Titanium plates deliver deep penetrating heat to both damp or dry hair. Locks in moisture and nutrients inside the cuticle for strength and elasticity. Infuses moisture into the hairs cortex as it straightens. 1 1/2" wide plates allows to cover more hair, making styling quicker and easier. 4 digitally controlled temperature settings up to 430 degrees. Before using, wash hair and towel-dry. Apply a heat protectant or styling aid. Divide your hair into small 1- 1 1/2" sections and run the iron slowly from roots to tips. The iron may make a hissing which is normal; this is the water evaporating from your damp hair. With all straightening irons we recommend running a comb trough hair before you slide the straightener. Continue gently through each section and make sure to keep dry sections separate from damp sections which may cause frizz. For in-store inquiries, use sku #267662.